Sunday afternoon. A wonderful lazy weekend, warm weather and lots of time to sew and chill out. Thinking of a swim but know that I need to organise dinner at some stage too. So tired of meat, even chicken. 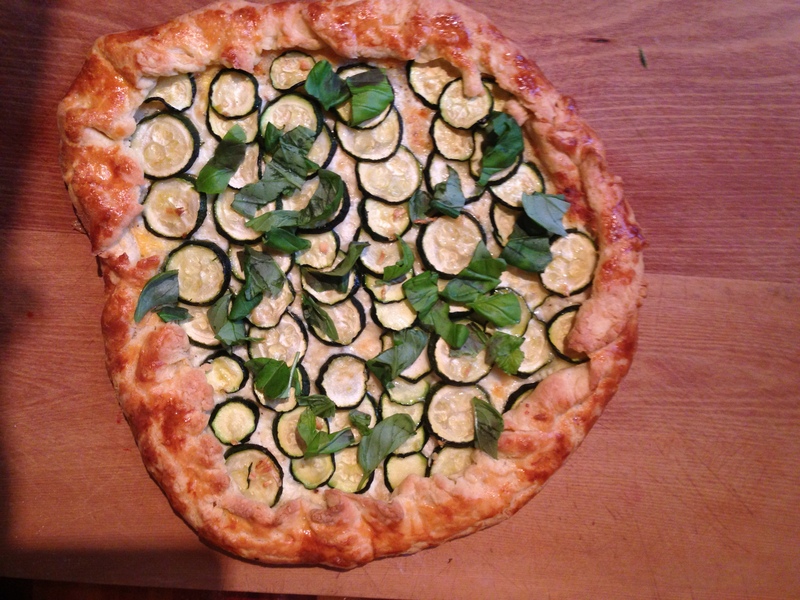 Looking for inspiration on the net, and plug in potatoes, zucchini into Google (because that is what i have plenty of). Some of the sites that come up have recipes that sound interesting but the pictures just don’t do it for me. Not getting the taste buds going at all. 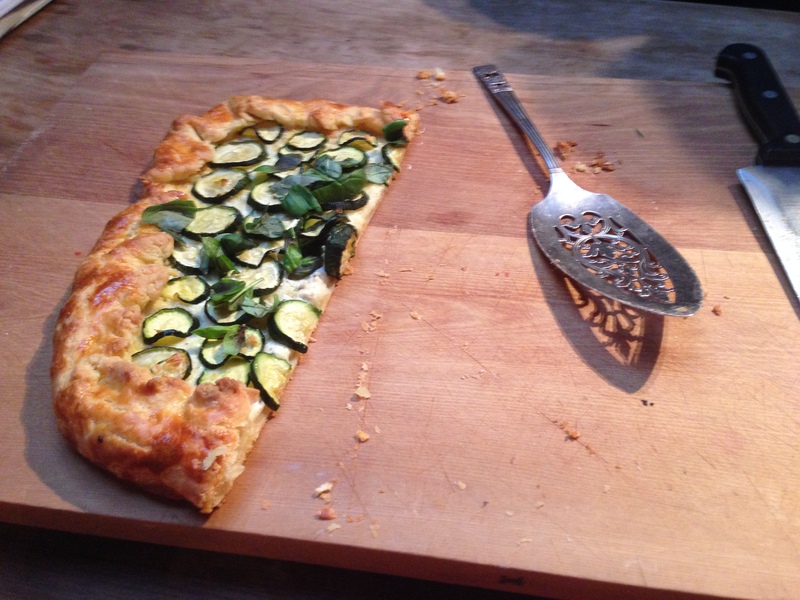 Then scroll through a few more pages and find Smitten Kitchen’s Galette “link“. This was posted in 2010! OMG, where have I been all this time – why haven’t I made this before! Oh yes, that definitely hits the spot. Decide to get the pastry underway before I go for a swim/exercise so that once I get home I can relax with a glass of wine before having to get dinner underway. Make dough: Whisk together the flour and salt in a large bowl. Sprinkle bits of butter over dough, tip into the blender and whizz until the pastry looks like crumbs. In a small bowl, whisk together the sour cream, lemon juice and water and add this to the butter-flour mixture. With your fingertips or a wooden spoon, mix in the liquid until large lumps form. Pat the lumps into a ball; do not overwork the dough. Cover with plastic wrap and refrigerate for 1 hour. Prepare galette: Preheat oven to 400 degrees. On a floured work surface, roll the dough out into a 12-inch round. Transfer to an ungreased baking sheet (though if you line it with parchment paper, it will be easier to transfer it to a plate later). Spread the ricotta mixture evenly over the bottom of the galette dough, leaving a 2-inch border. Shingle the zucchini attractively on top of the ricotta in rows, starting at the outside edge. Drizzle the remaining tablespoon of the garlic and olive oil mixture evenly over the zucchini. Fold the border over the filling, pleating the edge to make it fit. The center will be open. Brush crust with egg yolk glaze. 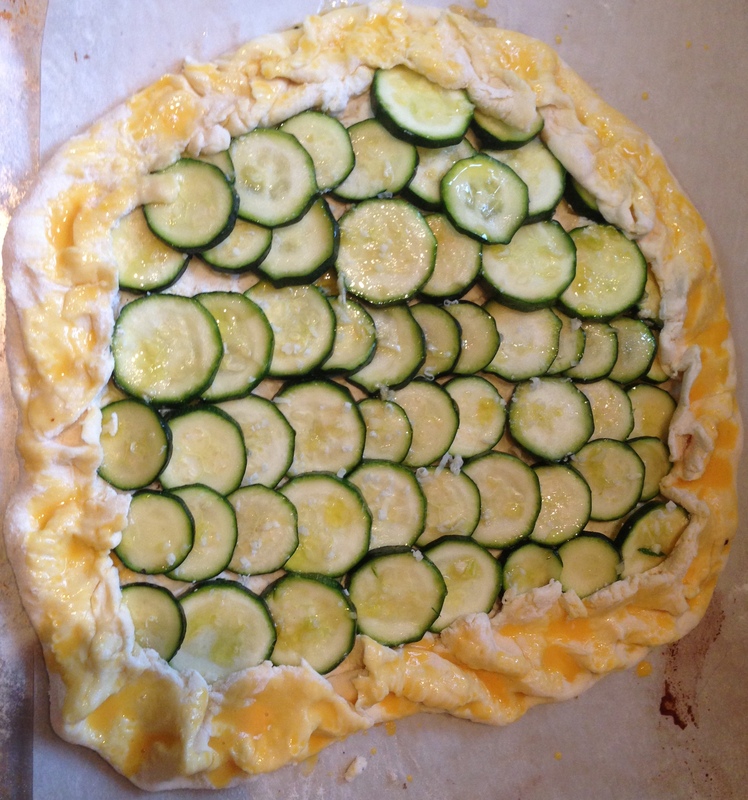 Bake the galette until the cheese is puffed, the zucchini is slightly wilted and the galette is golden brown, 30 to 45 minutes. 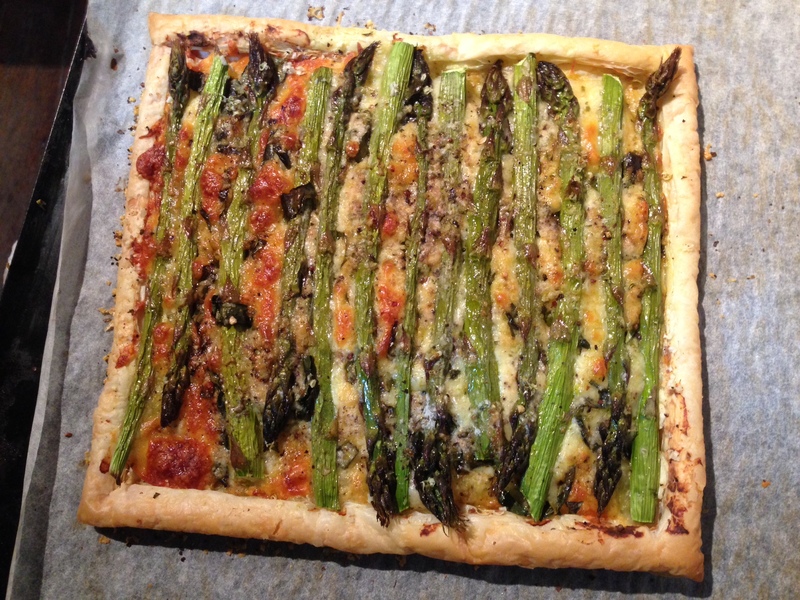 Remove from the oven, sprinkle with torn basil leaves, let stand for 5 minutes, then slide the galette onto a serving plate. Cut into wedges and serve hot, warm or at room temperature. 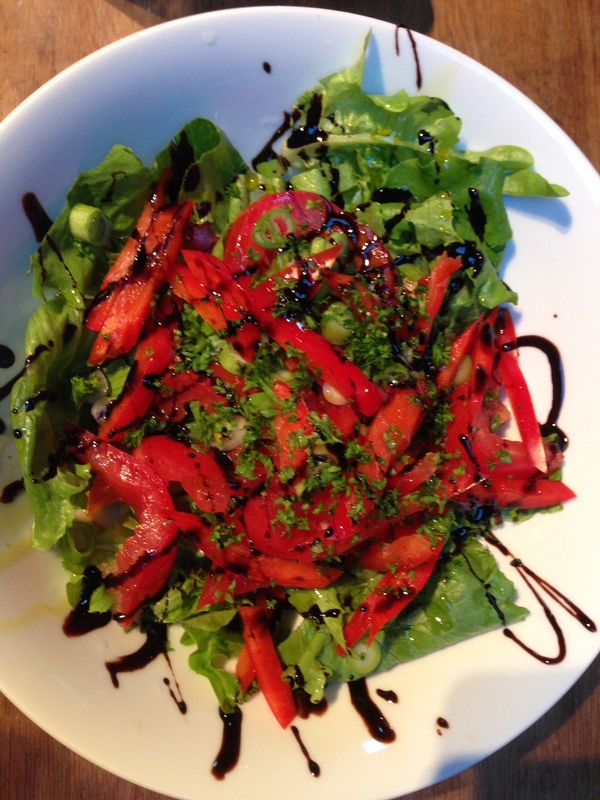 We added a green salad, with fresh, out of the garden, lettuce, rocket, chives, parsley, oregano and tomatoes. Mmmmm, will definitely repeat this.